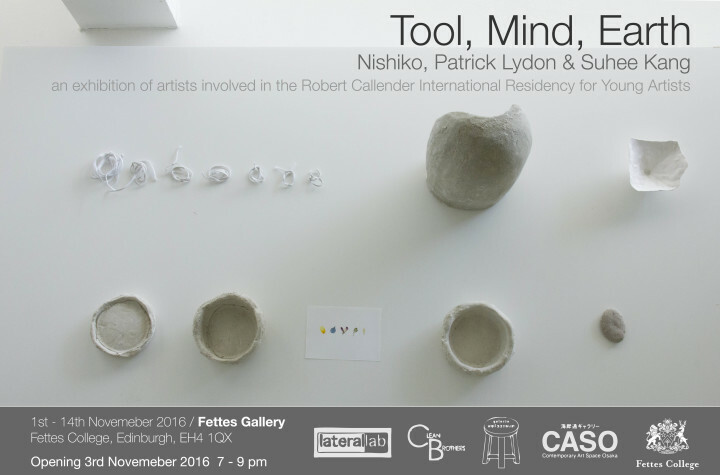 This week Suhee and I open a group exhibition with fellow Robert Callender Residency artist, Nishiko from The Hague, Netherlands. 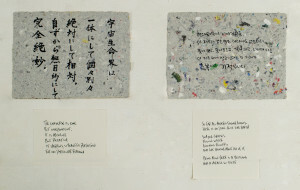 Nishiko is showing works related to her Repairing Earthquake Project which deals with her attempts to find and repair objects from the disaster area of the Great Eastern Japan Earthquake in 2011. The works on display in this exhibition are broken works made by Valerie Dempsey & Ronald Boer and repaired by Nishiko. Suhee and I are showing “Wisdom from the Field,” a new project of handmade paper and prose; ideas culled from our past five years of research and study on natural farming in Japan, Korea, Scotland, and the United States during the making of our film “Final Straw: Food, Earth, Happiness.” The film is also being shown in-situ for the duration of the exhibition. The prose we are exhibiting comes from the field of “natural farming” which, although widely regarded by environmental experts as the only practical way to feed the world while maintaining environmental sustainability, the practice of natural farming is still consistently – though predictably – marginalized by big business and mainstream media. It is both ironic and utilitarian that each passage is written on paper that we hand-made using the financial and business sections of newspapers in countries where the primary research took place. Although some of this “wisdom from the field” lies in the realm of metaphor, most begs to be used as the real and tangible foundations for building an equitable society. Each quote is a short, poetic verse that places the philosophy of the natural farmers in relation to our contemporary social and ecological issues. These words are not solutions in themselves, but thinking points, small seeds which, given some care can grow into tremendous living things, movements, actions. Through reading these quotes, we can be inspired to know that our individual actions and decisions – when built with a firm grounding in the reality of this nature – can make unfathomable positive impact. The exhibition “Tool, Mind, Earth” runs from 1-14th November 2016 at Fettes Gallery, Edinburgh, UK. It is curated by Jake Bee in collaboration with Elizabeth Ogilvie and the Robert Callendar International Residency for Young Artists. 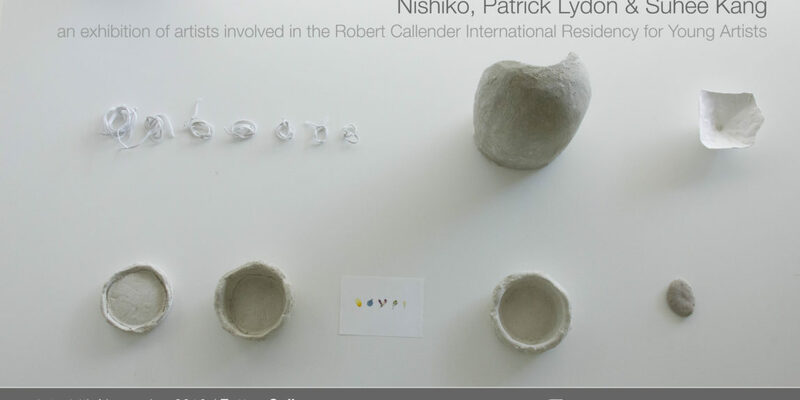 Additional support comes from Lateral Lab, Contemporary Art Space Osaka, Galerie Weissraum, and Fettes College. 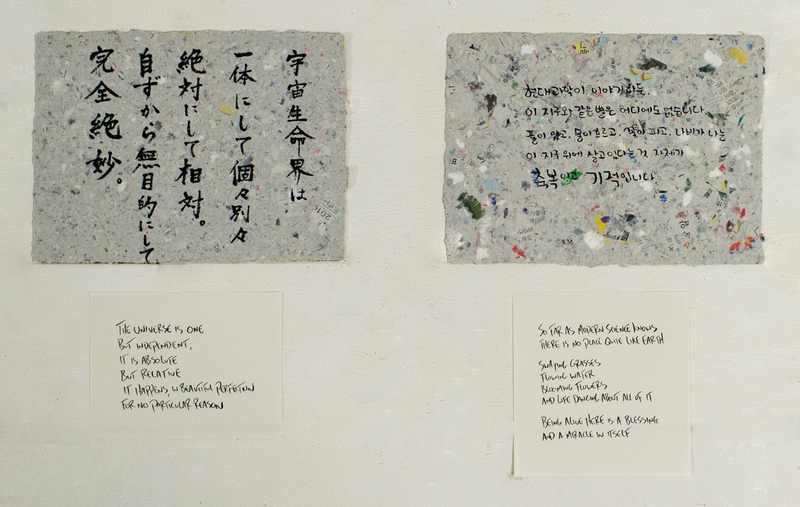 Thanks as well, goes to friend and producer Kaori Tsuji for lending her calligraphy to one of the panels. Previous Previous post: REALtimeFOOD in Megijima, Japan!